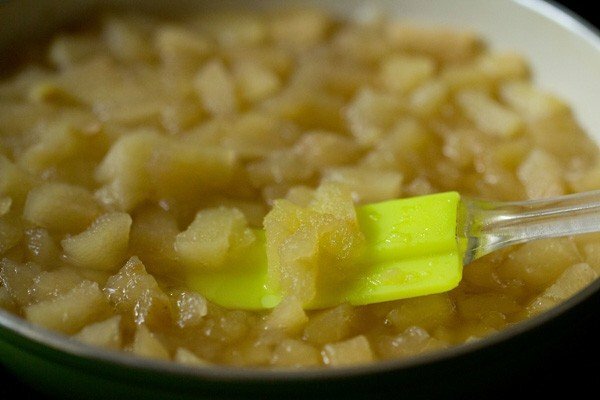 applesauce recipe - basic recipe of a no sugar applesauce. unsweetened applesauce recipe with step by step photos – making applesauce is no rocket science or difficult to cook. a ridiculously quick and easy method. all you need are just need apples and water. adding sugar is optional. i generally do not add sugar. in this recipe too, i have not added sugar as the apples were sweet. and if you are wondering what to do with the applesauce. well its so good, you can just have it the way it is. or add to your baked goodies. 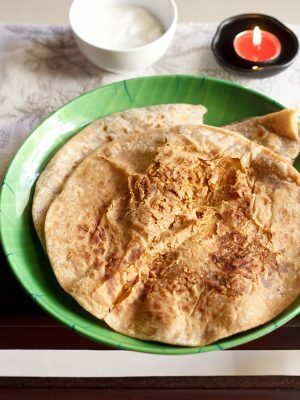 you can also make eggless pancakes and crepes with them. applesauce makes for a good egg substitute in cakes, sweet breads and muffins. i have baked cakes with applesauce and they come out very well. here is sponge cake recipe with applesauce. you can also add them as toppings to ice creams or make smoothies, milk shakes, parfaits and pies. applesauce also makes for a good weaning food for babies. if made without sugar like this recipe, then applesauce is also diabetic friendly. i usually make a small batch of applesauce, refrigerate it and use it as required. this batch i stored for about 15 days in the refrigerator. i never freeze it. but you can even freeze them. i usually add them to cakes, milkshakes and sometimes we just have it as it is. 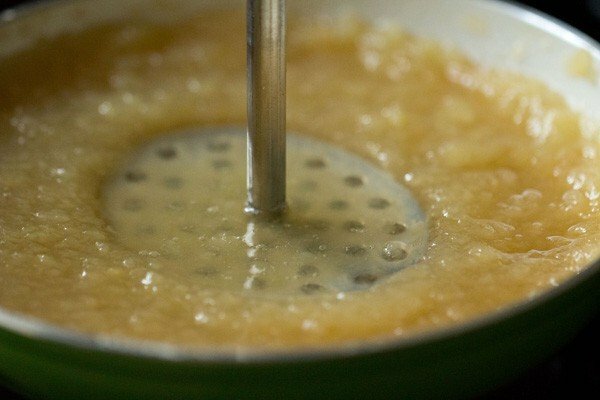 i am sharing a basic method to make applesauce. you can add your choice of spices or flavorings. i never add lime juice to applesauce. but if you want you can add it. 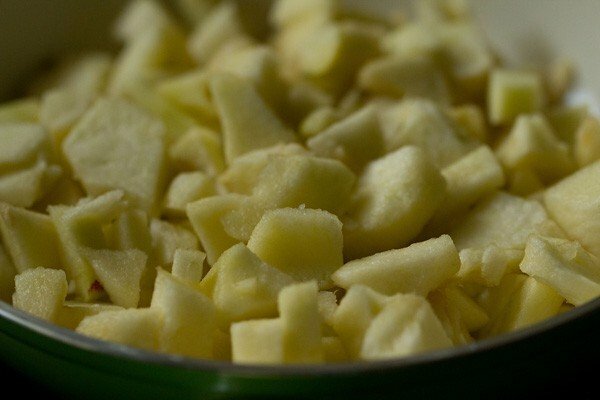 you can also increase the quantity of apples and make a large batch. if you are looking for more sauce recipes then do check tomato sauce, pizza sauce, peri peri sauce and schezwan sauce recipe. rinse, peel and chop the apples. place them in a sauce pan or pan. i used 3 medium kinnaur apples. you can use any variety of apples. add water. the water should just about cover the apples. bring this mixture to a simmer on a low to medium flame. you can add sugar if you want. if the apples are very sweet, then you don't need to add sugar. if they are less sweet or not sweet, then add sugar as required. you can also add spices like cinnamon or nutmeg at this step. quantities are mentioned in the recipe details below. simmer till the apples are softened. keep stirring occasionally when the apples are getting cooked. if the water dries out and the apples start sticking to the pan, then add more water. 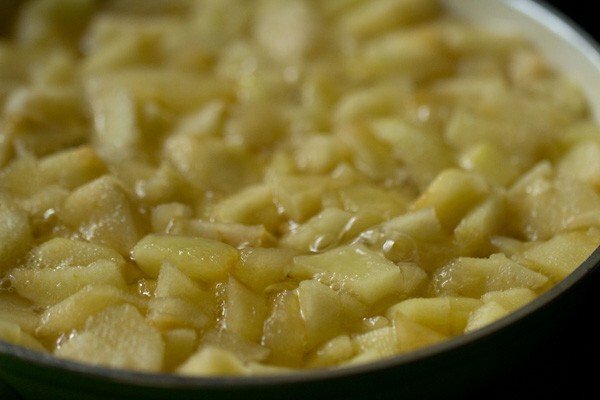 once the mixture becomes warm, you can either mash the apples or puree them in a blender. mashing gives a slight chunky texture. blending them will give a smooth texture. the final color of the applesauce depends on the variety of apples used. pour applesauce in bottles or bowls. once cooled refrigerate them. 1. rinse, peel and chop the apples. place them in a sauce pan or pan. i used 3 medium kinnaur apples. you can use any variety of apples. 2. add water. the water should just about cover the apples. 3. bring this mixture to a simmer on a low to medium flame. you can add sugar if you want. if the apples are very sweet, then you don’t need to add sugar. if they are less sweet or not sweet, then add sugar as required. you can also add spices like cinnamon or nutmeg at this step. 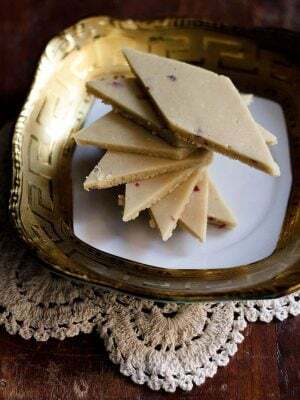 quantities are mentioned in the recipe details below. 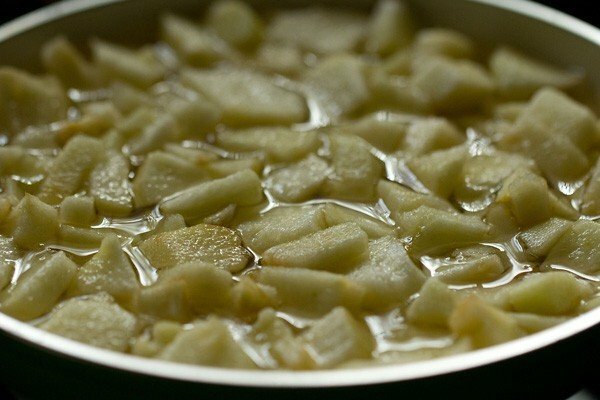 4. simmer till the apples are softened. keep stirring occasionally when the apples are getting cooked. if the water dries out and the apples start sticking to the pan, then add more water. i cooked for about 17 minutes on a low flame. 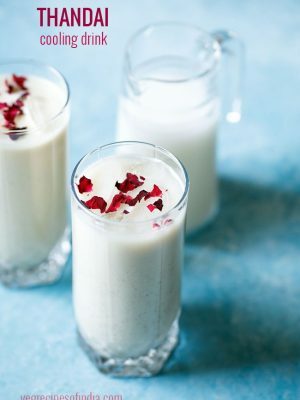 5. once the mixture becomes warm, you can either mash the apples or puree them in a blender. mashing gives a slight chunky texture. blending will give you a smooth consistency. the final color of the applesauce depends on the variety of apples used. the final pictures are of applesauce made from another variety of apples and hence the difference in color. 6. pour applesauce in jars. once cooled refrigerate or freeze them. I assume this is made with eating apples rather than cooking ones, or doesn’t it matter? can we cook it in pressure cooker instead of simmering for such a long time? yes you can make in the pressure cooker. just give one whistle. Trying your dishes everyday. Thanks a lot for your detailed methods. As requested by many, even I need some more dishes for my toddler. Keep going with your lovely recipes. welcome nancy. yes, i will try to add more recipes for toddlers. 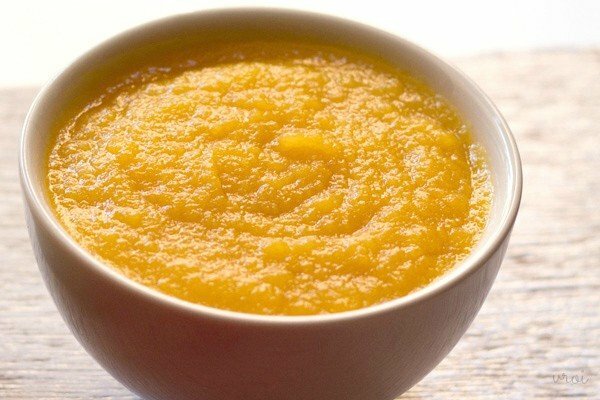 Hi Dasanna, thank u very much for ur valuable and tasty recipes I had 6months old baby,I want some more baby recipes for my child.can we store this applesauce? welcome swapna. i will add more baby food recipes slowly over a period of time. i stored the applesauce for about 15 days in the refrigerator. i never freeze it. but you can even freeze them. Thank u very my baby loves to eat this apple sauce.plz add some more baby recipes. welcome swapna. i will add some more baby recipes. this is awesome and definitely making this. its a good sub for sugar in baking and also once I start fruits for my baby, will be a quick snack food to pack in jars. thanks manasa. i agree with you. Yum! I make mine exactly the same way, when in a hurry I also cheat by zapping in the microwave. I also change it up regularly by adding some thinly sliced ginger while cooking or a cinnamon stick (used cassia bark when low on cinnamon). We also flavour with cardamon and star anise. My mum adds nutmeg to hers (but she even adds a bit of nutmeg to steamed cabbage). My children like to plop into into homemade yoghurt. thanks natalie for sharing your version. good to know this. wow…thank u so much going to make for my 8 month son…ur recipes are so easy to make…. welcome hina. thanks for your positive feedback. lovely….delicious recipe…i would like to know how this sauce replaces egg in cake . 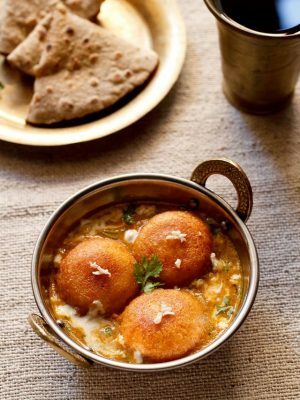 i keep browsing thru vegrecipes……. i am loving it! thanks sneha. its a simple replacement. instead of eggs add applesauce. Thx dasana, but my query is can we add this to any cake recipe or only the apple cake… Will it not give appley taste…. welcome sneha. you can add to any cake replacing eggs. 1 egg = 1/4 cup of apple sauce. recently i made a sponge cake with apple sauce and i will be adding the recipe also. the cakes do not have the taste and aroma of apples. 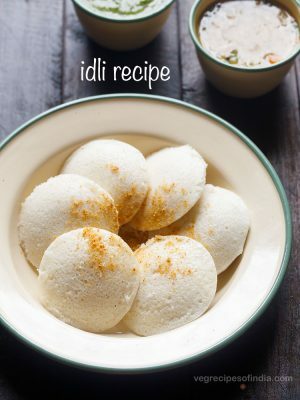 Hi Dasanna, I am going to try this simple and nutritious recipe soon. 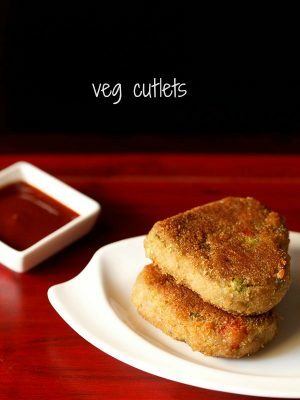 Hey I have been following your blog since the past one year and have tried numerous recipes. Most of them were a hit!! Now whenever my husband tastes something different during meals he asks “Dasanna”? Being a doc, I appreciate your skill in making the recipes nutritious and healthy. 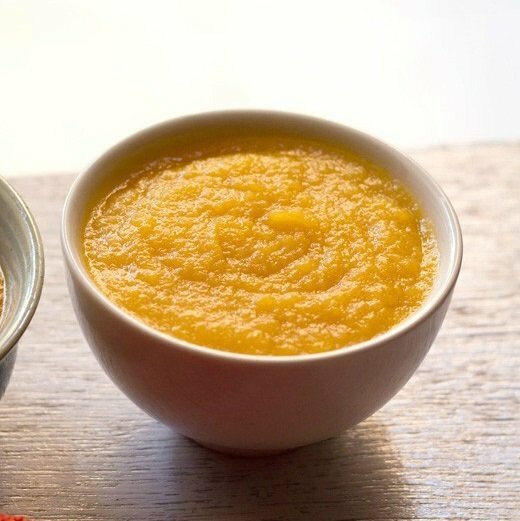 We are expecting our baby this month end and I was glad to see this apple sauce as it will be a very good weaning food. Kindly post more baby recipes, whenever you get time. It would be a great boon for people like us who are far away from India and have no luxury of getting homemade baby food made by Grannies. welcome dhanya. congratulations and all the best. thanks again for the positive feedback. 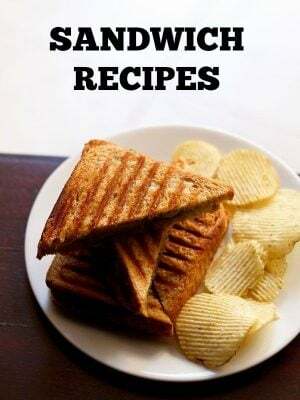 i will add some more recipes for babies and toddlers. 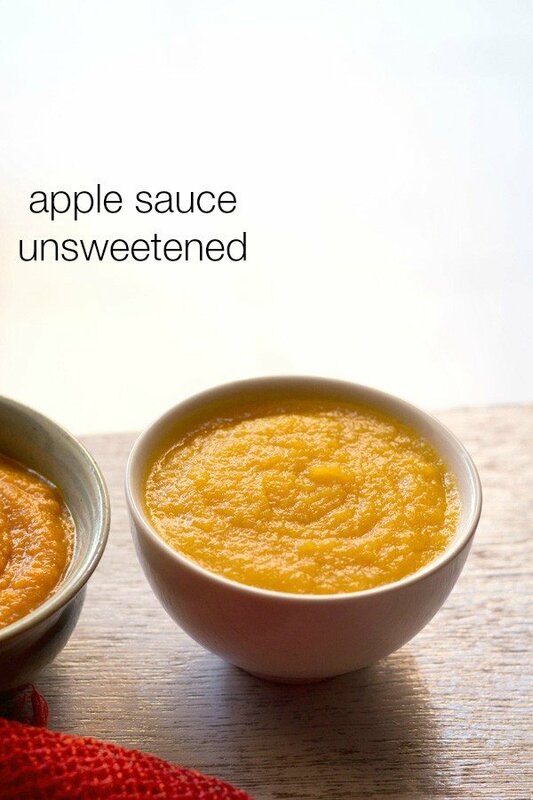 applesauce is available in stores but they have lot of preservatives. so its better to make your own.